Goran looks great on devices of all sizes, from desktop to mobile and everything in between. The theme adapts to any screen without sacrificing usability or design integrity. This template is tailor-made for homepage that introduces your business to the world. Rich, powerful, and flexible, the Front Page Template includes three optional featured page areas and three optional widget areas. You can also add a full-width leading image with a call to action, as seen in the screenshot above. Set your front page image — behind the text — as a Featured Image. The Featured Pages section of the Front Page Template is managed in Theme Options in the Customizer. The Grid Page Template displays all child pages of the page in a grid format. This template is perfect for highlighting case studies or services. One of Goran‘s Theme Options allows you to choose the sidebar’s default position — right or left. The Alternate Sidebar Page template will overrule this default on a given page, and that page’s sidebar will appear on the opposite side. In the Theme Options, we selected right for the sidebar’s position. This page template is displaying the sidebar on the left. 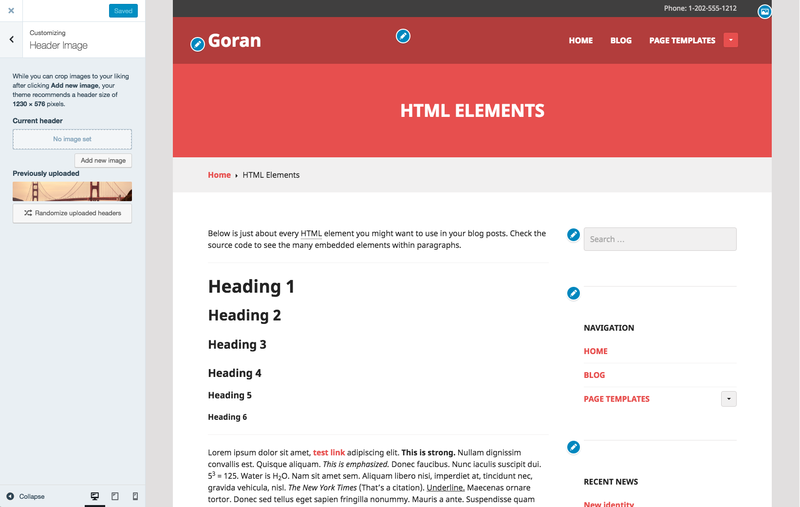 Goran allows you to have two Custom Menus: one in the theme’s header and one in the footer. To set up your menus, go to My Sites → Menus. Goran displays links to your social media profiles as icons using a Custom Menu. Icons for Twitter, Facebook, LinkedIn and most other popular networks are included. To automatically apply icons to your links, simply create a new Custom Menu and give it a name that starts with “Social” (e.g. “Social Menu,” “Social Links”). This specific name is important – it must start with the word “Social” to work correctly. Next, add each of your social links to this menu. Each menu item should be added as a custom link. Once your menu is created and your social links are added, you can display it in your Footer Menu. You can also create a new Custom Menu Widget to display it in any of Goran‘s widget areas as seen on the demo site. Goran will automatically display an icon for each service if it’s available. Sidebar Position: choose to display the sidebar on the left or right. Top Area Content: display some content above the header — perfect for a phone number or an email address. Thumbnail Aspect Ratio: choose the aspect ratio of the thumbnails used for the Grid Page Template or for the Featured Page Areas. Pages: show breadcrumb navigation: display a breadcrumb navigation on pages. Front Page: show title: display the Front Page Template’s title. Goran supports the Site Logo feature. To brand your site and include your business logo, navigate to Customize → Site Title and upload a logo image in the space provided. An optional sidebar widget area, which appears on the right or left. 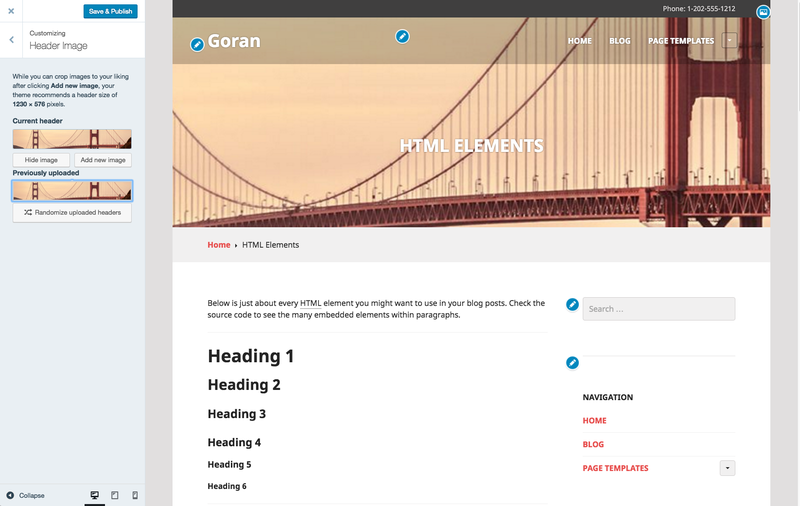 Goran displays featured images behind the title on static pages, or in the large main area when using the front page template. If a page has no featured image, the header area displays the custom header, which can be added at Customize → Header Image. The custom header will not displayed on the blog page or individual blog posts. The main column width is 700 except in the full-width layout where it’s 1086. Featured Images for posts are 772 wide by unlimited high. Featured Images for pages are 1230 wide by 1230 high.